The following list of terms and definitions for counterintelligence professionals was obtained from the Defense Security Service Center for Development of Security Excellence’s Facility Security Officer Toolkit. 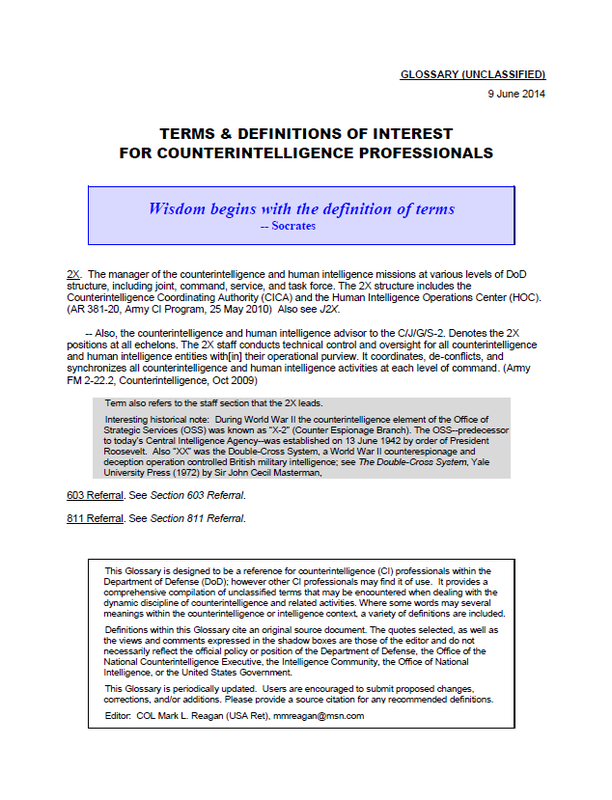 This Glossary is designed to be a reference for counterintelligence (CI) professionals within the Department of Defense (DoD); however other CI professionals may find it of use. It provides a comprehensive compilation of unclassified terms that may be encountered when dealing with the dynamic discipline of counterintelligence and related activities. Where some words may several meanings within the counterintelligence or intelligence context, a variety of definitions are included. Definitions within this Glossary cite an original source document. The quotes selected, as well as the views and comments expressed in the shadow boxes are those of the editor and do not necessarily reflect the official policy or position of the Department of Defense, the Office of the National Counterintelligence Executive, the Intelligence Community, the Office of National Intelligence, or the United States Government. Window Dressing. [Tradecraft jargon] Ancillary materials that are included in a cover story or deception operation to help convince the opposition or casual observers that what they are observing is genuine.